A longtime staple of Cajun cuisine, catfish are now growing in popularity as pets. While many caught in the wild have difficulty adjusting to domesticated life, farming facilities produce fish that thrive in captivity. Size: Of all bony fish species, catfish display one of the broadest size ranges. While most species kept as pets top out at about 6 inches in length, others, such as the Mekong giant catfish, have been known to grow as long as 9 feet. Color: They don’t have scales and breathe right through their skin. As such, most species, including the channel catfish and the flathead catfish, are gray in color with dull, matte skin. Light flecks or spots are also seen on some individual fish. Variants: The blue catfish is one of the largest members of the species. Though blue catfish, like all other species, don’t have scales, they have flat, slightly metallic blue skin coloration instead of the gray seen on most other variants. Even big catfish tend to get along well with other fish species, and they tend to be peaceful when sharing a pond or aquarium with species like the koi fish. They are social and prefer to keep company with other catfish, so pet owners should consider keeping them in groups of three or more to ensure their happiness. 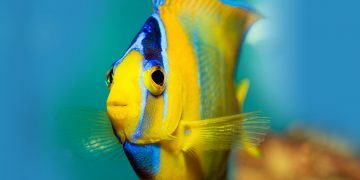 Angelfish are so smart they are able to recognize their owners when they walk into the room. Read on to find out if this type of fish is for you. Feeding: All species love to feed on algae, so it’s necessary to provide them with a continuous source, whether in the form of live algae or algae wafers (which are available at pet stores). Mix in fresh vegetables and shrimp pellets to provide dietary variance and ensure the nutritional needs of your fish are met. Tank Care: For species that are small enough to live comfortably in an aquarium, such as armored catfish, water with a neutral pH level and a temperature of about 75 degrees Fahrenheit is recommended. Keep wood and live plants in the aquarium and provide plenty of hiding places to address their natural instincts – these fish have a “prey” (rather than “predator”) mentality and naturally seek to hide. Big catfish species aren’t suitable for freshwater aquariums and must be kept in outdoor ponds that replicate their natural habitats as closely as possible. Again, this includes live plants, deep recesses and lots of nooks and crannies to hide in. Health Concerns: Infectious diseases caused by fungi, bacteria and parasites are the most common causes of health problems. Keeping your fish pond or aquarium clean is the best way to prevent these infections from occurring. Channel catfish anemia (CCA) is a condition you should watch for. Also known as “no-blood disease,” this condition is linked to a dietary niacin and folic acid deficiency. Unusually pale skin is the most common symptom, along with listlessness and loss of energy. Consult a veterinarian promptly if you notice any such symptoms in your catfish. Life Expectancy: The average life expectancy is about 10 years, though individuals may survive significantly longer under controlled conditions in captivity. 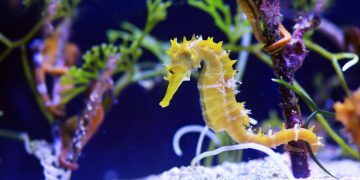 Seahorses are known for their unique courting rituals. It's best to own ones that were bred in captivity to ensure they flourish. Read on to learn more! Tetra fish are known for their neon coloration. 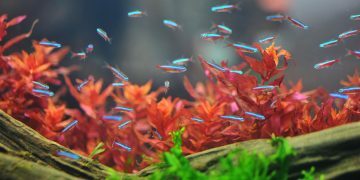 They mostly get along with other tetras, although they can be kept with other placid fish such as goldfish.